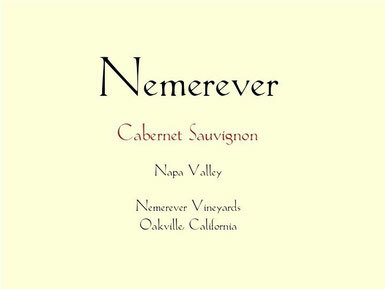 Nemerever Vineyards is located in Oakville, California. We have six acres planted on both hillside and alluvial vineyard blocks. We make 100% Cabernet Sauvignon wines, estate grown, produced and bottled. I've been simultaneously blessed and spoiled to enjoy some 80s and 90s Bordeaux over the past few years. After which, it's very difficult to "turn back" to the New World! I've really come to appreciate and desire that aged, nuanced, Old World profile.